Antlers are an ancient archetype representing male energy, strength and fertility. 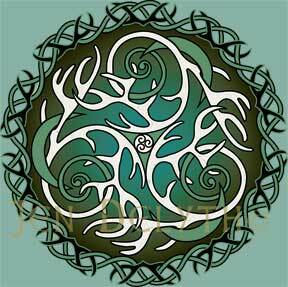 The Horned God is a powerful symbol to the ancient people, named Cernunnos, Herne, Lord of all Stags. The great branching horns manifest the Spirit of the Forest - the esoteric mystery of the Tree of Life. The growth and shedding of his antlers are a seasonal symbol of regeneration. The moon is an ancient archetypal female symbol. Arianrhod, the Welsh goddess whose name means Silver Wheel was worshipped as priestess of the moon. The moon is mistress of the rhythms of tides water, emotion, psyche and womb cycles, life, death, creation. This weave of Antlers and Moons balance together the potent symbols of male and female energy. Both archetypes represent rebirth and regeneration, together they contain the Mysteries of earth and sky.